Portable diesel generator using clean solar energy,combing mobility and environmentally friendly accessibility. Simple and realistic for any location. This structure is perfect for any site, and can be set up, and used by any single person. Pure Power solar systems use clean fuel each day with no enviromental impact- no noise, smell, or harsh effects from emission of diseal fuel. With the most trusted names in the industry, General Electric Polycrystalline panels, Xantrex inverters and charger controllers, Hawker/ Interstate industrial batteries are some of the leading names in energy. To provide and deliever to everyday people and businesses. Economically and enviromentally sensible alternatives to energy needs through a clean energy alternative. Its the small choices that we make daily that influence our world. Being sustainable isnt about buying the most organic products, or reducing your consumption of trash.. but its the thought process you go through. Think about how each decision you make and how you can change that choice into an eco-friendly option. 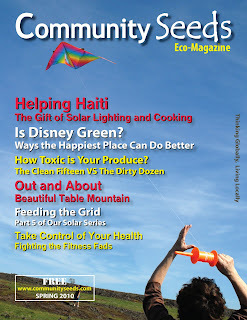 This issue is filled with articles on green living and sustainability issues. There are also articles with a focus on health and social responsibility. Don't forget to look for the pictorials to see if you are in a photo or if you recognize someone. Thanks for being one of the thousands of readers who enjoy Community Seeds Eco Magazine. Please forward this email or send the link to family and friends so they can enjoy this free, green resource as well. Please support our efforts to promote sustainable living by purchasing advertising or by becoming a sponsor. Please see our Media Kit for ad sizes and pricing. You can read the Spring issue of the magazine now! 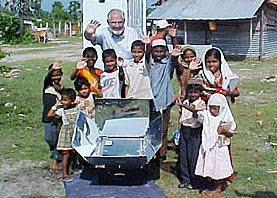 Go to: http://www.communityseeds.com/ . The spring issue will be released March 1, 2010. So many times I have written about the community support that we have received and I continue to be surprised at the number of dedicated readers that follow Community Seeds Eco Magazine (AKA CS Eco Magazine). As we have grown and developed, we have maintained our commitment to sustainability and to the community. These commitments have taken us down a path of assessment and speculation about the current status and future of the magazine. We want to continue to offer the magazine as a free resource, educational publication, and forum for sustainability articles. However, with our donations of 25% to non-profit organizations, the free help that we offer sustainability and community groups with fundraising, the overhead of running a business, and the costs of independent contractors, we are not able to continue the magazine as it stands. I have proudly dedicated two years to this cause and this publication with no salary or any money from proceeds, ever. In fact, my family has continued to donate funds to keep the magazine going. In addition, we have been able to get a few, wonderful sponsors. Most people do not realize how much money it takes to run a business and have a publication (even on-line). We would like to continue to publish Community Seeds Eco Magazine and give to the community, so we have come to the conclusion that we need to go non-profit. In fact, have already started the process! We hope that by going non-profit, we can get more financial support and continue our dedication to the environment, the community and to this publication. We encourage readers to become a part of this process by continuing to send in articles, purchase advertising, becoming sponsors. Now, you can also help by making donations. You may also donate service or eco friendly prize items for our raffles. All donations will be tax deductable and at least 25% will be given back to the community. We have a tax ID number and we have been accredited by the Better Business Bureau. We have a few loose ends to tie up and we should have the 501(3) process completed soon. Once again, we thank our readers, writers, advertisers and sponsors for helping us continue on our mission: to help make us be a little more socially, environmentally, and community aware. I am very excited to head up this new non profit venture and continue to be proud of the work we do. Have a happy, healthy, green spring! In a time of economic concern, it behooves one to acknowledge that taking the time to consider the environment, in the forms of reducing, reusing and recycling, can significantly reduce the weary spender’s costs. So before all the presents have been appropriately ripped open and, depending on the gift, have either been gouged open, passed around or discreetly kept in the box for the stealthy return, please read the following facts and tips to help ease the holiday strain on your pocket book and on the environment. • An average California household throws away over 34 pounds of plastic water and soda bottles each year. • Every 90 days a recycled aluminum can makes its way back on the shelf as something useful. • 80-100 years - that's the lifespan of an aluminum can that gets tossed into the trash instead of a recycling bin. • 700 years - that's how long a trashed plastic bottle will sit in a landfill taking up space, refusing to degrade. • 1 Million Years - Put a glass bottle in a landfill and that's how long it'll sit there doing nothing. Recycle it and it can live forever. o T-shirts: Fourteen 20 oz. plastic bottles yield enough fiber for an extra large T-shirt. o Carpet: It takes 14 20 oz. plastic bottles to make one square foot of carpet. o Fleece Sweater: It takes 63 20 oz. plastic bottles to make a sweater. o Jacket Fiberfill: Fourteen 20 oz. plastic bottles yield enough fiberfill for a ski jacket. o Sleeping Bag Fiberfill: It takes 85 20 oz. plastic bottles to make enough fiberfill for a sleeping bag. o Decorative home decor: bowls, vases, etc.